How do you really know if your time on social media is well spent? How can you truly tell if your strategy is working for you? How do you decide when it’s worth spending your hard-earned cash on a software upgrade, assistant, or other forms of support for your online marketing? Metrics are meaningful data points that measure your progress towards your stated goals. The beauty of online marketing these days is that you can find data relating to just about anything. The trick with metrics is figuring out what you want to measure and why it is meaningful for you. You do this by asking: What insight or action is it going to lead to? If the answer is a blank look or a shrug, then don’t bother tracking it. It’s probably just a vanity metric. By the way, this explains why “naked” numbers, like a count of your followers, mentions, or shares, are meaningless. Because they don’t – on their own – tell you what to do next. Of course, the hard part is, no-one can really tell you what metrics you should track track with any certainty. Only you can work out what matters, because only you know what you are aiming for. 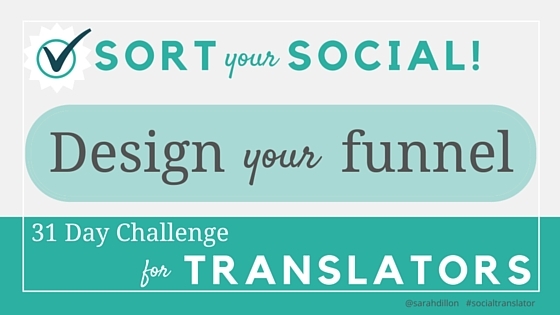 However, I don’t think I’m going out on a limb here if I say that, for most translators, our aim is to have the work we do on social media lead to a paying client. But bear in mind that there are quite a few steps between your social media account and your checkout process. One way to give context to your numbers is to cross-reference your traffic with your conversions to see which activities result in the most potential growth for your business. So, for example, a post to your Facebook page might have a low number of views (traffic), but a high number of those viewers click through to your website (conversion). This would make it a lot more valuable than a tweet which might have a high number of views or retweets (traffic), but end up with a low number of people clicking through to your website (conversion). I’ve picked a website view as a conversion here as for most of us, our websites are a key driver of leads into our sales funnel. (Kevan Lee explains this example in more detail in his post on goal setting strategies: see #7). 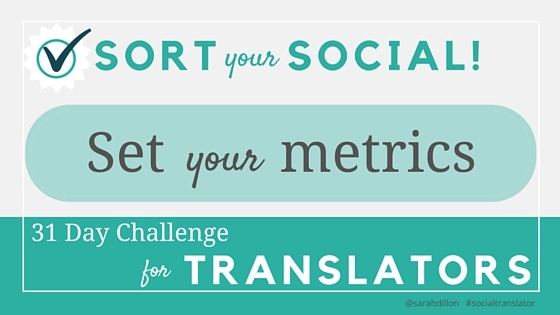 Give it a whirl: choose one or two meaningful metrics, and see how it goes. Which Stats Matter: The Definitive Guide To Tracking Social Media Metrics, by Kevan Lee at Buffer. An unbeatable resource on this topic for small businesses. Has an extremely useful section on how to set up social referral tracking to your website in Google Analytics. Day 4: Understand Your People – Really! SYS Day 4: How to truly understand your buyers – and find more of them! We’re still on ideal buyers today, translators, but I promise a change of topic tomorrow! The reason our buyers warrant so much time and energy is because if you’re clear on who they are, I believe your social media planning will be a walk in the park. 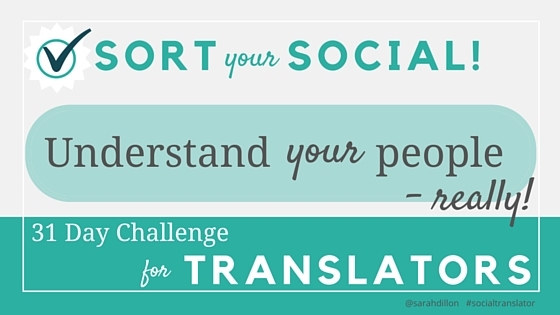 Once I’d found my first translation client, I found it very easy to find more. I just found out all I could about them and their business (in as non-stalkerish a way as possible), and used that as a springboard to finding more clients just like them. It was like it had a strange snowball effect. Over time, I was able to gradually change my client base in an intentional way by playing around with the variables of my “prototype client”. Sometimes it took longer than I wanted, but in the end, it almost always worked. In hindsight, I realise that what I was actually doing was creating and working from buyer personas. The great news is, buyer personas are an actual marketing Thing that anyone can use to great effect! Personas are a very useful sales and marketing tool that can help you truly understand your ideal buyer and be clear on exactly where and how to use social to speak to them. You draw from fact, fiction, or a little bit of both, to come up with a detailed description of a well-rounded character – in this instance, your ideal buyer. You can give this character a name, photo or whatever you need to make it as real to you as you possibly can. Each time you tweet, blog or address your target audience in any way, you imagine addressing this one individual and let that guide all subsequent decisions. Voilà. You’ve got yourself a full book of clients. The result of targeting this one specific persona is you’re more likely to craft a message that resonates with the very many real people who have some of the same characteristics as your persona. It’s also a lot easier to sit down and write when you have one specific person in mind, rather than a vague amorphous crowd of maybe clients. So how do I create a persona? There are myriad templates online that you could use as a basis for creating your persona. I’ll include links to some below that might be particularly useful for translators. Bear in mind that in an ideal world, you’d create a separate persona to represent each of the roles involved in your buying process. This is a situation often faced by translators, which can make it particularly tricky to define our ideal buyers in the first place. But none of us live in an ideal world, so I recommend starting with baby steps and creating just one to begin. For example, if you know that typically, a marketing assistant usually conducts the initial search for a translator and then presents a shortlist to their marketing manager for final approval, then that’s two personas right there. These two individuals enter the buying process at different stages and have different needs and concerns, so you need to engage with them in different ways to address that. (Hint: this is where you may find that social media is a better way to reach out to some personas more than others. That’s fine too – at least you know you’re not wasting your time). Lots of @replies? They’re chatty, at least in social terms. RTs? They’re listeners. Who are they listening to? Do many people share their content? They have an engaged community of followers, if so. Who are their followers? When are they most frequently online? … And so on. Add these deets into your buyer persona. Start with a list of some of your existing or ideal clients. Ask Facebook to generate a list of similar people for you. Check out these people’s publicly available Facebook profiles, and use the information you glean as inspiration when you’re fleshing out your Buyer Personas. Use Rapportive, the email tool I described yesterday, to find out more about your existing buyers and again, use this as inspiration for your Buyer Personas. So, Buyer Personas – worth a shot, no? 4 Questions Answered About Buyer Personas, by Barbra Bago at the Content Marketing Institute. Nice list of characteristics here. Yesterday was about understanding the buyer’s journey. Today is about understanding your sales funnel, and linking it to your social strategy. In other words, same thing but from a different angle 🙂 But one that’s still worth pursuing, so bear with me. So what’s a sales funnel, and why does it matter to me as a translator? Your sales funnel charts the process you take your customers through before they buy from you. But instead of looking at the customer experience, it focusses more on the volume of customers in each stage. Hence a funnel, representing the natural drop-off in the number of potential customers you have moving through each stage until they emerge as buyers from the spout at the bottom. First, the funnel shape represents the kind of content a potential buyer might find useful, depending on the stage they are at. Broader and more general at the top of the funnel, more detailed and specific as they reach the pointy end. You can target your social media interactions to reflect this and to help move people through the funnel. Second, and more importantly, looking at your sales process in this way can help you diagnose and fix business issues before they occur. This can help prevent the feast-or-famine situation freelancers so often fret about. How many leads do I have in my funnel right now? What is the total potential value of each deal in my funnel? 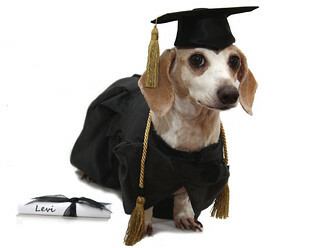 How long does it take, on average, for leads to move through my funnel to a sale? What can I do to bring more potential customers into the top of the funnel? What am I doing to pull leads toward the bottom of the funnel? Are they getting stuck at any point in the funnel? What can I do to clear the blockage, if so? Am I spending my time and energy where it matters? A sound social strategy is what keeps your potential buyers engaged as they work their way down your funnel. It’s also how you can ensure the right content appears in front of the right people at just the right time. Matching your sales funnel to your social strategy doesn’t have to be complicated or time consuming. 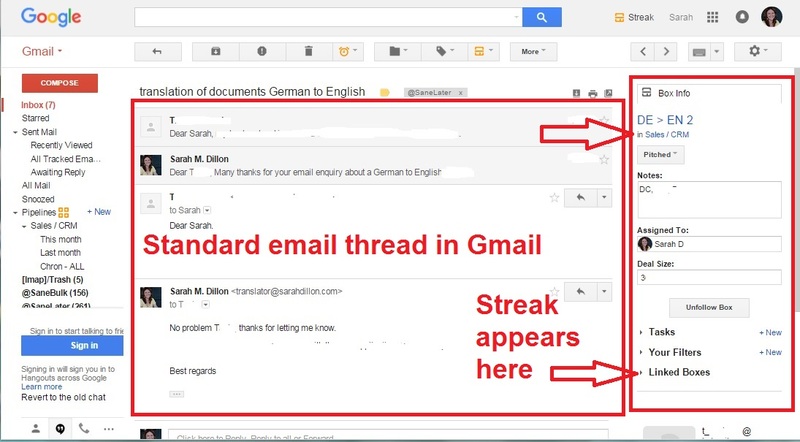 For example, a couple of years ago I started using a free Gmail plugin called Streak to classify my email enquiries from inside my email account, based on their stage in my sales funnel. It was simple to set it up just how I wanted it, and it was incredibly easy to maintain as it was right there in my inbox, all the time. Streak allows you to sort your emails into your sales funnel from within Gmail, using parameters of your choosing (see box on right, above). Each day, I was able to just log in and see who I needed to follow up with, and to what end. 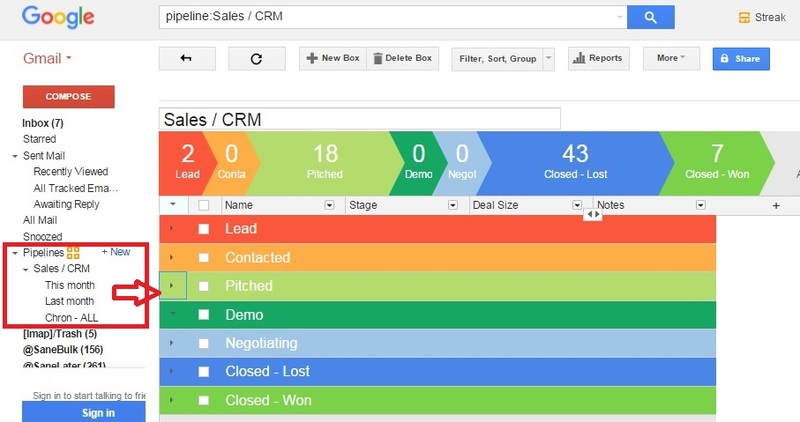 What Streak looks like in Gmail: it allows you to sort your emails directly into a sales funnel of your choosing. Based on this, I could make decisions on where to better invest my time. Combined with the free Gmail plugin Rapportive, I was able to make sure I was connected to my prospects on any relevant social channels too. So when it came time to follow up or touch base, it was easy to select the channel that was most appropriate based on the kind of outreach I was aiming for. This is what the Rapportive plugin looks like, also in the sidebar of Gmail. 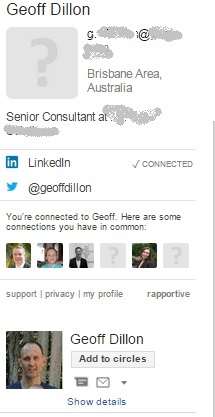 It automagically pulls detailed contact info into your email account to give more context to your interactions, including most recent Tweet, etc. (Note this is not a client – this is my partner. He couldn’t afford a hallowed spot in my sales funnel :)). Best of all, over time, I was able to spot very strong patterns in the kind of enquiries that were likely to lead to a sale. Even after several years of freelancing at that point, there were still some surprises. As a result, I was able to make sound decisions on where I should be spending my time and energy. Of course, this system may not work for you, and that’s fine. But hopefully it will give you some ideas on how you might link up your own sales and social strategies. I’ve never spent masses of time on social media. When my income is based on my output, as it is for many translators, I need to be certain that time spent on anything other than wordsmithing is going to be worth it. The best way to do that is to be clear on my goals before I ever fire up Facebook. When you’re clear on what you want to achieve from social from a business standpoint, your online activities can be more focussed. It seems a lot of us go about our social strategy backwards: we pick technologies or platforms first, before getting clear on what we really want to accomplish. It’s a lot easier to decide where to invest your energies when you view everything through the lens of “Is this going to get me closer to or further away from my stated goal?”. When the answer is yes, you do it. When it’s no, you don’t. When you have a choice of activities to select from, you pick the one that is most likely to move you furthest in the right direction. It really can be as simple and as complicated as that. Having clear goals for social has also helped me resist the urge to tinker, fiddle around “just because”, and ascribe meaning to what I’ve done after the fact. For example, “I can clock that last hour up to professional development because I learned how NOT to go about designing a Twitter background!”. For the best results, sources agree you need to formulate your goal so it’s super specific. If your goal fits in all three of the above categories, for example, then it’s probably too broad. My goal for social is to get in the routine of publishing content again. That’s it. This challenge is a way for me to do that. Of course, it’s easy to get caught up in the reasons why you can’t reach your online goals. Especially as a translator, when you may be considering international audiences, business-to-business markets, or other such variables. But you still need to start somewhere, and that’s where simple and focussed comes in. For me, it’s as much about building momentum as it is about achieving the goals I set myself. Shooting an arrow at a target is no guarantee you’ll hit the bulleye. But without a target, the only guarantee is that you’ll never hit it at all. I know which odds I’d rather be playing. 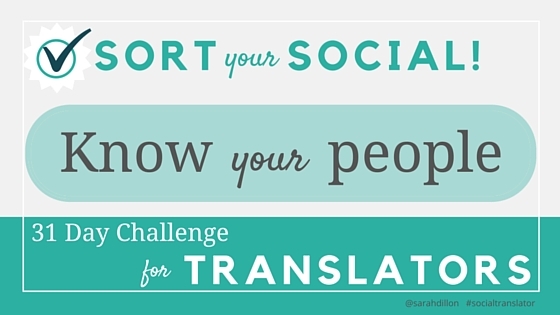 [tweetable hashtags=”#socialtranslator”]We can all find 15 mins a day for online marketing. This is how you ensure those 15 mins make a difference. [/tweetable] (click to tweet). 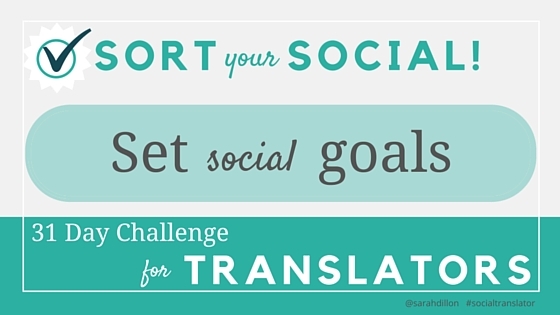 So, go set yourself some goals for social! Kevin Lee at Buffer has an excellent post on goal setting as it relates to social media, inlcuding several different ways of formulating goals for business purposes. If you read only one article on this topic, make it this one. Marketo has some great examples of social media goals (pdf) broken down by platform in their free social media action plan. Charles Ngo has an interesting article on goal setting in general if you’d like more info on the benefits associated with that. Each weekday in OctoberI’m going to suggest a task to work on for whatever pocket of time you can carve out that day. You can choose to follow my suggestion, adjust it to suit your circumstances, or come up with an alternative – whatever makes most sense for you. Or just dip in and out as it suits. My social media marketing is due some TLC. Follow along in October as I get it sorted! My social presence is pretty shabby at the moment. My Twitter is hit and miss, there are tumbleweeds rolling through my Facebook page, and frankly, all the mismatched graphics hurt my eyeballs. This is a system for my online marketing that I’ve followed for about 2 years. It works for a couple of reasons. In other words, I like to have my cake and eat it too. I set aside some time to give my social media a re-haul. During this time, I focus 100% of my time that’s NOT revenue generating or family time on my social media. I approach it like a puzzle: I have only X amount of time, and Y amount of resources. What can I make happen with that? What worked really well last time? How can I multiple that? What shortcuts can I figure out, using only what I have to hand right now? I give up Netflix, going out, and a bunch of other things for the designated time until SOMETHING gets done. Then I log out and move on, and I don’t allow myself to think about it again for another 6 or so months. Boom! You’re welcome. And that’s it. Only, of course, it’s not really… my biggest challenge is the ongoing battle against perfectionism and its evil twin overwhelm. So throughout the process, I steel myself with the reminder that done is always better than perfect. DONE is always better than perfect. Done is ALWAYS better than perfect! So, it seems I’m due another stint on social. But this time, I thought it might be fun to invite other translators to follow along too. A kind of “social” social spring clean, if you will. (A spring you don’t have to be in the southern hemisphere to enjoy, of course!). Each weekday I’m going to suggest a task to work on for whatever pocket of time you can carve out that day. You can choose to follow my suggestion, adjust it to suit your circumstances, or come up with an alternative – whatever makes most sense for you. Or just dip in and out as it suits. Remember to keep it simple, avoid overwhelm, and be crystal clear on the impact we want our actions to have in the wider scheme of things. Done is better than perfect! Our aim is to have a social presence that is sharp, snappy, and self-sustaining by the end of the month. See you on 1 October! Some of the best translators I know don’t have a degree in translation, so they are certainly not a requirement to becoming a translator. However, an increasing number of newcomers to the profession are opting to pursue a formal (usually postgraduate) qualification in the field. Looking for a few translators WITH and WITHOUT an MA to talk about the relevance of a translation Master’s for the job. Please help and RT!! 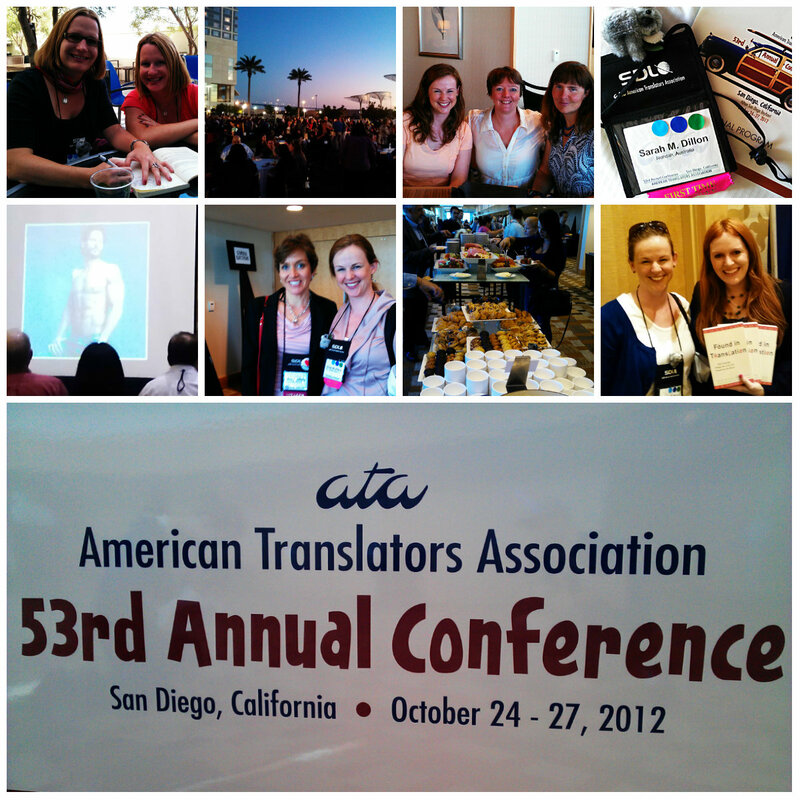 Here’s a high-level look at some of my impressions of the 53rd Annual Conference of the American Translators Association (ATA), held in San Diego 24 – 27 October 2012. 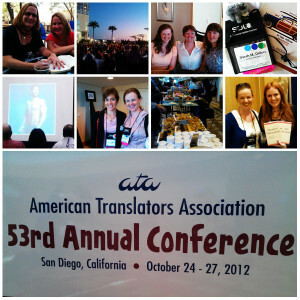 I’m just back from the 53rd Annual Conference of the American Translators Association (ATA), which was held in San Diego 24 – 27 October this year. Here is a little conference round-up in images (written report to follow). In the meantime, check out the conference Twitter feed and associated quotes, links and photos here. 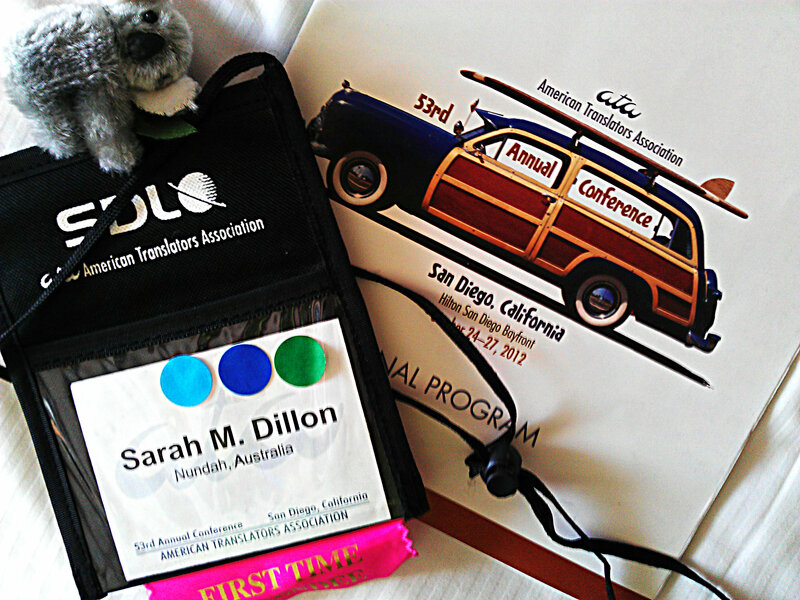 Hello to any AUSITeers who may be dropping by after my recent talk at the AUSIT QLD Mini-Conference in Brisbane.